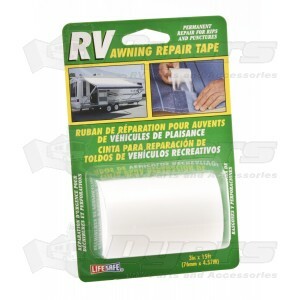 A must for your RV toolbox! Clear tape offers the utmost in durability, strength and unbelievable adhesion even on damp surfaces. Permanent repair for rips and punctures. Excellent resistance to tearing in any direction, very aggressive adhesive. Repairs rips and punctures in: sails, canvas, awnings, rainwear, tents, napsacks, pool covers, canoes, pool liners, hunting appareal, seat covers, air duct hoses and more!